As my children and I were all labouring under the effects of persistent colds, I remembered a "recipe" for herbal steam tablets in the January edition of Daphne's Diary. Made using bicarbonate of soda and essential oils, these tablets are intended to release lovely smelling vapours to invigorate while you shower and they're very easy to make at home. Here's how we made our own herbal steam tablets, along with a few tips we learned along the way. Line your bun/cupcake tray with liners or rounds of greaseproof paper. Empty your bicarbonate of soda into the mixing bowl and add a little water, mixing all the time. Keep adding water (perhaps a teaspoonful at a time) until the mixture becomes a firm paste which can hold its shape. It's really important not to make your mixture runny! We made this mistake the first time we tried to make the tablets, which resulted in almost three days of drying time! Add around 20 drops of each of your favourite essential oils to the mixture and give it a final stir to distribute the oils through the paste. Distribute the mixture equally between your twelve moulds. Pat the paste down to firm and level the tablets. Leave the tray in a fairly warm place (such as a sunny windowsill) to dry. The tablets will probably smell fairly strong, so I wouldn't advise placing on or near a radiator as the scent may well become overpowering. Once the tablets are completely dry, you can remove them from the tray and store in a mason jar or lidded plastic tub until you are ready to use one. We left ours in their liners to prevent them crumbling before having the chance to use them. Run your shower water until it gets hot, place a tablet on the shower floor and enjoy! As I mentioned at the beginning of this post, our recipe is based on one which we found in the magazine, Daphne's Diary (which, by the way, is an amazing publication!). We made two attempts at the shower tablets, being much more careful with the amount of water we used the second time round, though wee still a little concerned that the resulting tablets crumbled way too easily when we removed them from their cases. For anyone who is having issues with these being "crumbly", try using 1 cup of baking soda and 1/3 cup of water (plus maybe a few tbslp more) and baking for 20 minutes at 350. 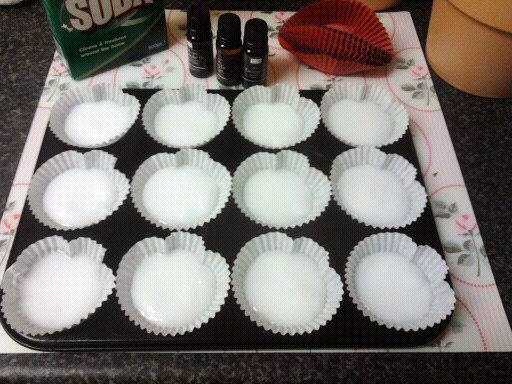 THEN add a few drops of each essential oils to the cooled "puck". That was a suggestion from a commenter and I tried it this morning with great success! I'm a quick shower taker (less than 5 min), and my "disk" was only about 1/3 gone at the end of the shower. We haven't tried this yet, though intend to later this week when I can source another box of soda to make them with! Just don't be tempted to add the oils before baking lest your oven (and kitchen) become infused with the scents! While I was familiar with "bath bombs" and bath salts infused with lovely scented oils, I hadn't thought about using shower tablets before reading the article in my magazine. 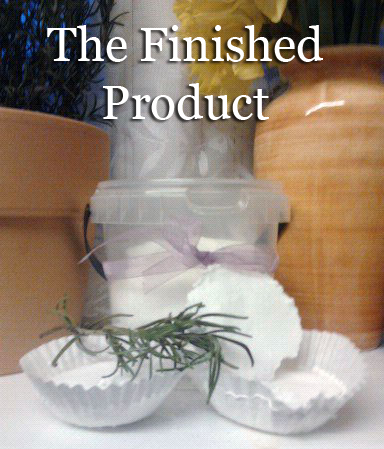 Although our initial attempts have easily crumbled, we did feel rather invigorated (and certainly less congested) after using them, and are sure to make them again! Have you ever made your own herbal steam tablets? Which essential oils did you choose to use? I'd love to know your thoughts and opinions on this simple recipe, particularly if you have any suggestions for how they can be improved. Please feel free to leave your comments and suggestions below, or visit Glamumous on Facebook to leave your comments there.